With all the amazing design and flipping shows, it is hard to resist the do it yourself designing options. My favorite shows currently include Restaurant Impossible and Love It Or List It. 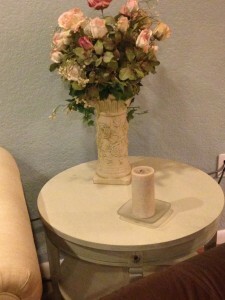 In addition to remodeling, I love to redecorate my space. I recently had a small addition built on my home to expand my home office space for my healthy chocolate business. My business was growing and I needed a bigger office. Now I have a beautiful view of the pool and the backyard and I can watch the sandhill cranes as I work as well as watching the palm trees sway. You can’t beat that. Well anyway, somehow the opportunity the addition presented has interested me in painting vintage furniture with Annie Sloan chalk paint. I have honestly never worked with anything quite like Annie Sloan products and am just thrilled. I have had wonderful support from Annie Sloan stockists here in Tampa and Fort Myers, Florida and I keep learning new techniques. The video above is one of my recent projects I was working on when I could not sleep one night. It is a vintage Lane furniture piece. 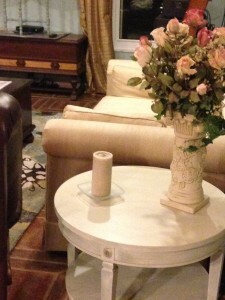 I decided to use Annie Sloan Chateau Gray chalk paint . I then did a wash with Annie Sloan Old Ochre. I ended up doing two coats of the wash and went a tad darker on the top. I then waxed with Annie Sloan Clear Wax and Voila I have a piece I can truly be proud of. This is a great way to relax and get away from the stresses of the day. Not that sharing healthy chocolate with the world is really that stressful, but having three teenage boys, a hubby and a dog, well that alone can be a handful. So now you know a little about me. I love healthy chocolate and Annie Sloan chalk paint. If you would like to sample our healthy chocolate and learn why it is so good for you, all my Annie Sloan chalk paint fans can order a free sample pack of chocolate. Oh and did I mention you can lose weight eating this chocolate and it tastes amazing? No wonder I love it so much. All I ask is that you cover the shipping and handling. Here is my vintage Lane table finished. I am actually quite proud of myself on how it turned out and am glad to see it in it’s rightful place in my family room where it belongs. So what do you think? Have I peeked your interest just a little bit with this Annie Sloan paint stuff? Just so you know, the paint is pricey but it goes much farther than you would expect a quart of paint to go. I could do an entire king bedroom suite with one quart if that gives you any idea. You also don’t have to do much prep work at all with this paint which is perfect for someone like me that wants immediate results. Passionate about Annie Sloan chalk paint. you keep blending or painting until you get the look you want. If you want a clean look, a distressed look, cottage or vintage, have at it. One of my next projects will be my barn door project off the office. I have not had much luck finding vintage doors like I had hoped. Instead I will be creating my own vintage look doors from new doors from the local hardware store and a combination of three or four colors of Annie Sloan paint distressed and with clear wax and then a dark wax. I really love the dark wax but honestly that is a blog post for another day. I am Lynette. I think you have figured I am a bit obessed. First with dark healthy chocolate and then with Annie Sloan chalk paints. Actually I guess you could say I am passionate, that is likely more accurate. I would love to hear from you so contact me if you want to discuss Annie Sloan projects or Beyond healthy chocolate. I love them both dearly. I can be reached at 941-216-5727, you can email me at [email protected] or visit my healthy chocolate site at MyChocolateVitamins.com. Be sure to stop by again. I can’t wait to see you! NextWhere Is The Best Place For Your Teenager To Buy Their First Car; Ebay, Craigslist or the local newspaper?